After JVC bought the speed accuracy of its turntables to near perfection levels, our engineers took a long, hard look at other enemies of accurate music reproduction-extraneous vibration and resonance. These phenomena are related with sympathetic resonance frequencies of turntables-the tendency of turntable components to resonate and vibrate in sympathy with certain sound waves at certain frequencies. JVC has discouraged resonance in various ways in all its turntables. One way is by providing tonearms of low-mass straight designs mounted on solid bases. Another angle of attack we use is our electro-dynamic servo tonearm. 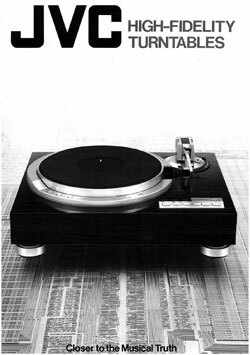 JVC Turntables owners manual, service manuals and schematics are for reference only and the Vinyl Engine bears no responsibility for errors or other inaccuracies. The PDF files are provided under strict licence. Reproduction without prior permission or for financial gain is strictly prohibited. This website is not affiliated with or sponsored by JVC. Posted Sun, 10/10/2010 - 01:47 by tpaps777. Iam instrested any one who can help me get a hold of a mnaual for a J.V.C. ql-a51 Turn Table manual, Ive lossed the one i had. Posted Sat, 10/25/2008 - 18:03 by steveperry1981. I need the jl-f50 turntable manual, and you list all of the turntables, but that model.